Yesterday was Bogie’s 8th birthday! Well, the birth date that the vets and I picked when I rescued him. They estimated he was 15 months old and counted back from the date of the vet appointment. 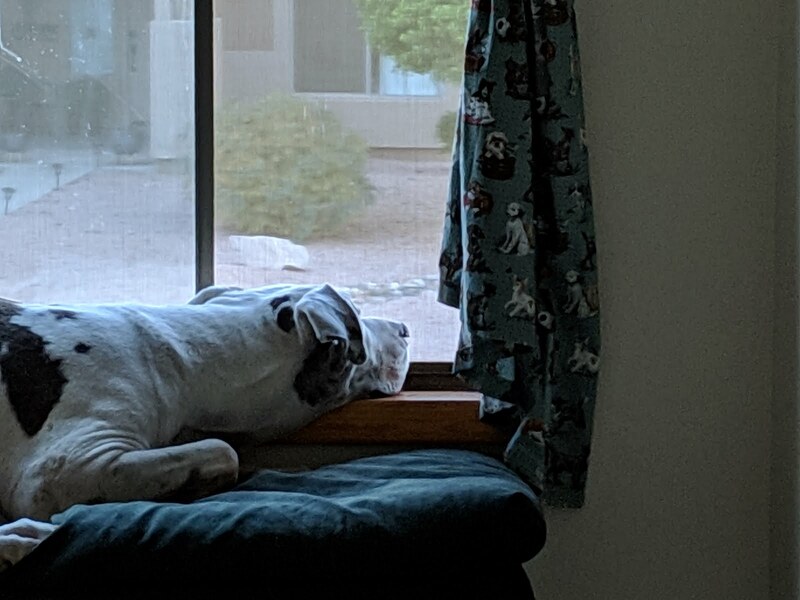 He loves sticking his nose out the window and watching the activity on the street. I only open the window halfway because Angel tends to lean on the screen. Not so much now that I put the bench in front of the window. But one day I came home and the screen was hanging half out of the window. I shudder when I think she might have fallen out. Bogie has been a joy and a pain. Until he was properly trained - a literal pain. Pain in my shoulder from him pulling on the leash. Pain in my knees and hands from falling when I tried to stop him from chasing cats. But since his training, he's been a joy. A big cuddle-bug. A great walking companion. A social butterfly eager to say Hi to everyone we meet. And most of them are happy to pet him. Happy Birthday Big Boy! I hope we have many more together.